One of the things with which we in the East Bay are blessed is a very large regional park system. I had the chance this weekend to visit one of the newer parks, Pleasanton Ridge, for the first time. This area has quite a bit of colorful history. I first started bicycle riding through the area about 30 years ago, sometimes passing through Sunol, where I was this weekend. But the history goes back much further than that. The most famous landmark of the area is the Sunol Water Temple, part of San Francisco Water Department‘s aqueduct system bringing water from Hetch Hetchy Reservoir in the Sierra Nevada. Look closely in the first picture here. (As always, click on the image to see a larger version.) Right in the middle, the little white spot in the distance between the rows of olive trees is the water temple. I had the good fortune of visiting one of the old homestead properties that still lies within the regional park. The site was originally homesteaded by a single woman in the late 19th century, as part of an olive producing area. 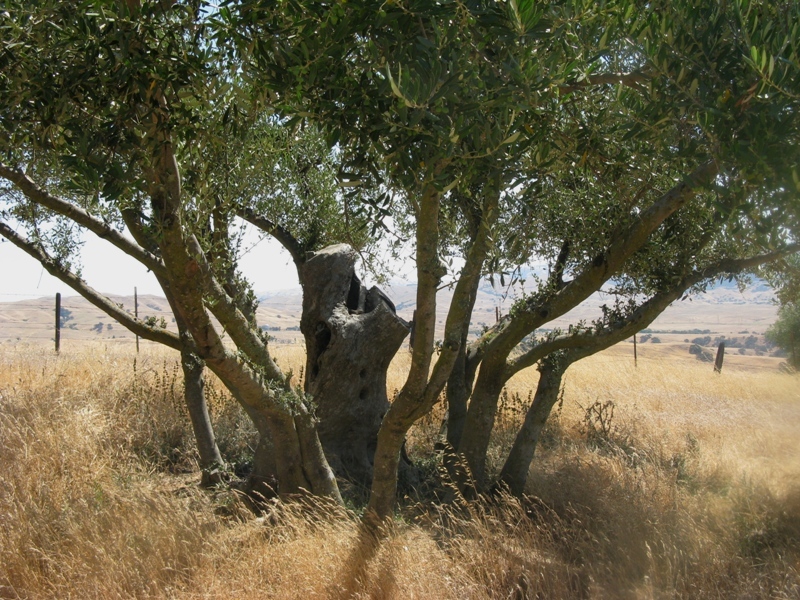 The homestead still actively produces olives for olive oil from the original trees. You can get an idea how old the trees are by noticing the large old tree trunk surrounded by the later sprouts that are harvested currently. 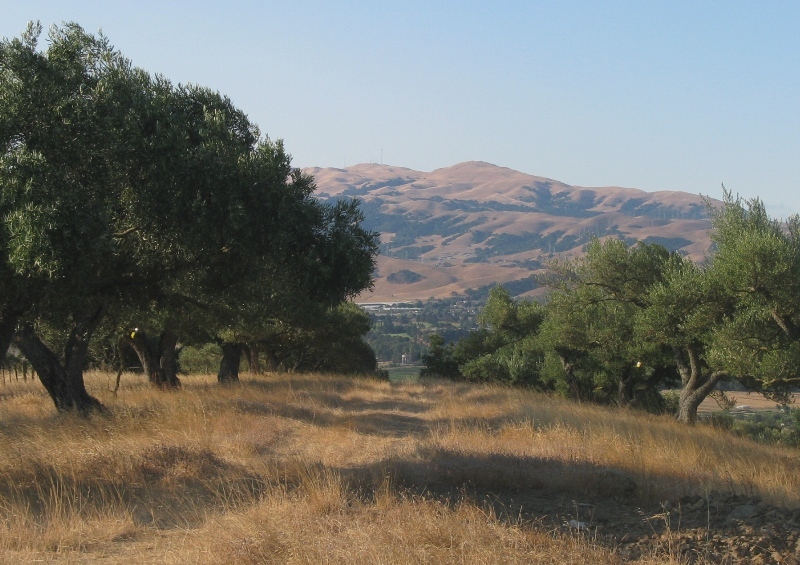 For more information about the homestead history and current olive production, see an earlier article in Edible East Bay. We hiked in the southern part of the park, where many of the old olive trees still thrive. 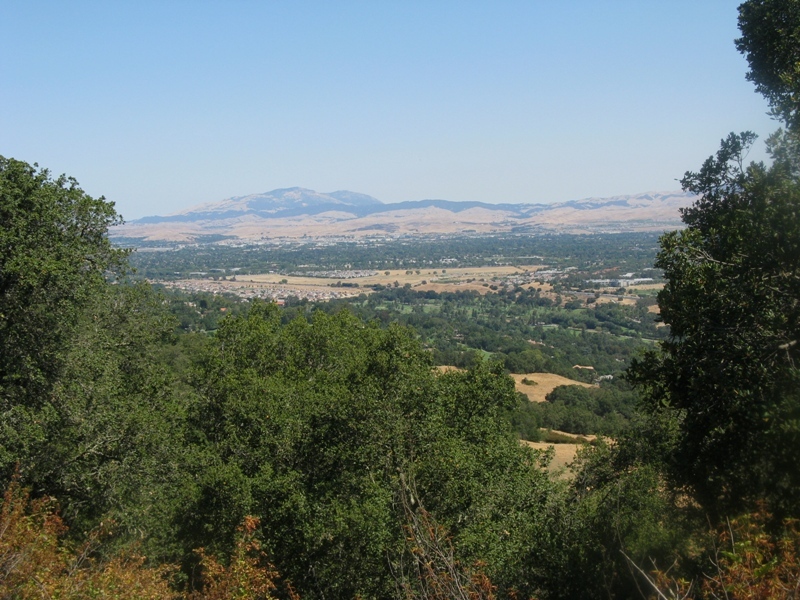 At one point in our hike along the ridge, we could look north across Pleasanton to Mt. Diablo in the distance, where I was camping a few weeks ago. Read my previous post about that trip.